The third installment of Big Bad Wolf’s The Council is a successful midway point for the series. While some issues from the first two episodes persist, episode three really pushes the narrative forward. The quality of the storytelling only evolves, making the wait for the next episode even more painful. Episode two ended on an intense cliffhanger, so there’s an immediacy to the opening events of chapter three that feels similar to earlier chapters, but with higher stakes. The mystery of Louis’s mother is resolved and many of the questions raised in the previous chapter are answered. Players learn more about where Louis’s mother has been, how the Order functions, the truth about Mortimer, and the mystery of the occult. Episode three even resolves some of episode two’s issues, in particular everyone’s reaction to the death of Elizabeth Adams. Originally, the way characters nonchalantly brush off Elizabeth’s death seemed like a fault in the narrative. However, later in chapter three, players begin to understand more about the Order and just how motivating politics and world matters can be even when presented with mortal peril. Like earlier chapters, Ripples is a combination of exploration, conversation, and puzzles, only this time the consequences of a player’s mistakes are much higher. In chapters one and two, failing a puzzle once or twice hardly felt like it would affect the game’s outcome. That is not the case for chapter three. The confrontations are more intense and the possibility of altering the story in a negative or irreversible manner is very real. Chapter three delivers stress inducing adrenaline rushes that leave the player wanting more. While some of the puzzles are challenging and fault the player for mistakes—some punishments being harsher than others—the game doesn’t force the player to redo puzzles or lead them to a “Game Over” screen. In some ways, the game does a great job handling agency. So long as players are willing to live with the consequences of their decisions. 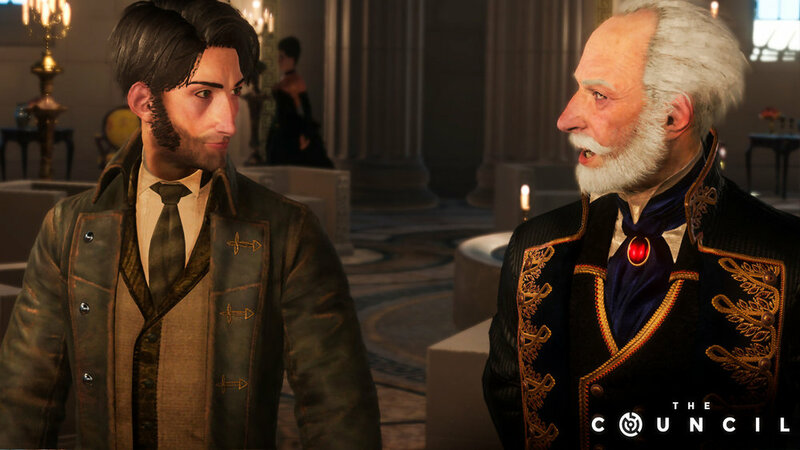 While the narrative continues to grow and become more compelling with every chapter, chapter three’s strength could very well be a weakness for some players. Ripples introduces a major plot twist that opens up the historical world of the game to more paranormal elements. Such a twist may not appeal to players who have come to enjoy the more realistic drama found in the game, but for those intrigued by the occult elements found in episode two, the twist is a refreshing and welcomed expansion to the adventure. While the storytelling remains the strongest aspect of the series, some of the faults found in earlier chapters persist. At this point, players just have to accept that not all lines of dialogue are delivered with the same effort, especially where Louis is involved. There are occasional issues with the lip-syncing and frame rate, but the biggest issue is the same annoyance present in episode two, the never-ending hallway treks. A lot of it feels unnecessary because there’s nothing to engage or investigate between rooms, minus a few items here and there. All the wandering around interrupts the tension and overall narrative pacing. Minor frustrations aside, the height at which the stakes have been raised and the tension in this portion of the narrative adventure make it worth the annoyance. Chapter three is by far the most engaging chapter thus far in the series. It will be interesting to see how certain consequences play out in chapter four.